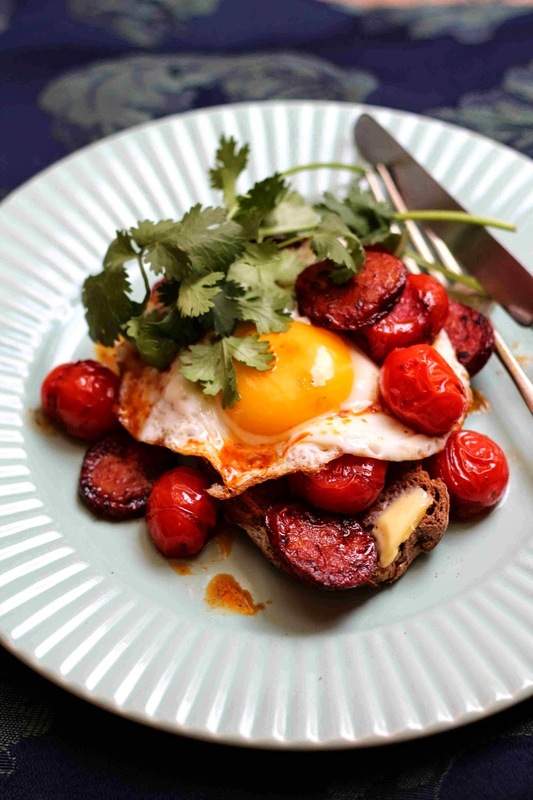 Sometimes life just calls for breakfast at dinner time, better known as 'brinner'. Nothing bad needs to happen for this to take place - it's just one of those things; you get a craving for eggs and delicious comfort things and the only thing that will fix it is brinner. There is a sense of guilty pleasure that accompanies eating brinner and I'm not sure why - but that naughty tingling feeling where you're defying the laws of acceptable human behavior makes it taste that much better. Especially when you eat it with a beer or a large glass of wine. 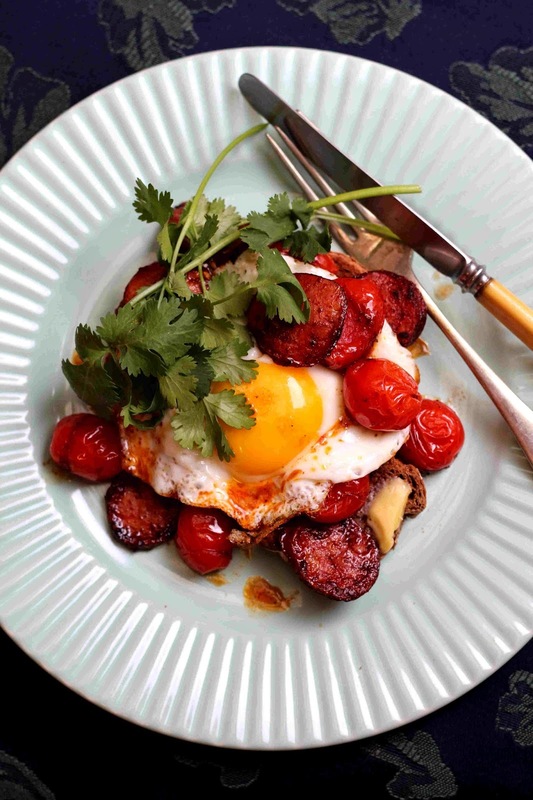 This is my ultimate brinner: it has a slight Spanish feel to it and is spicy and rich and glorious! Put a non stick pan on med-high heat and, once hot, add a little olive oil and fry the chorizo with the cayenne, salt and smoked paprika for a minute or so, turning once, until slightly browned. Add the tomatoes and balsamic reduction and continue to fry covered, tossing occasionally, for about 6 minutes or until the tomatoes skins are breaking and they are softened and just beginning to collapse. Toast the bread of your choice and lather with butter. 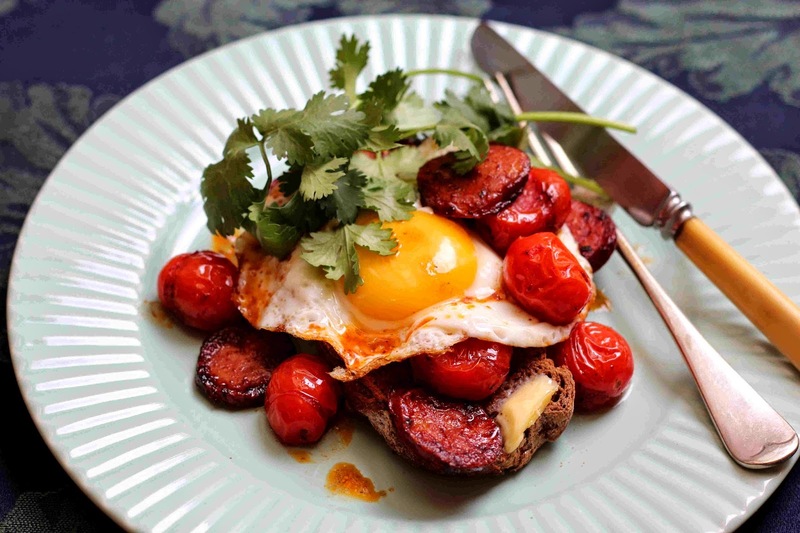 Fry as many eggs as you'd like in a little olive oil and/or butter and serve with the chorizo/tomato mix on the toast, a little seasoning and finish with coriander.